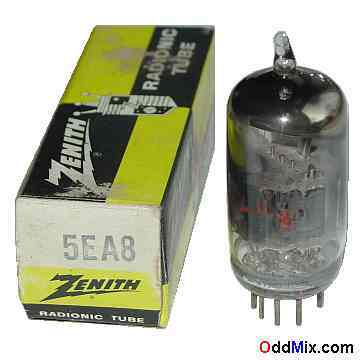 This is an original GE 5EA8 Medium-Mu Triode Sharp-Cutoff Pentode electronic tube. The 5EA8 was developed for color television applications. The pentode part applications included RF, IF, video, AGC, Class A amplifier or reactance tube. The triode side was designed to be used for low-frequency oscillator, sync-separator, sync-clipper or phase-splitter circuits. Excellent for replacement, antique radio, instrument, TV television restoration projects, experimentation, circuit research or to set up a private vacuum tube museum. It is NOS tube - New Old Stock, unused, boxed, excellent condition.